July is a busy time on the farm! This time of year we are busy making our own rye grass hay. The process actually starts the year before while planting our grass silage. Included with our grass silage mix is a seed called rye grass. This grass was harvested as part of our silage (also fed to the cows) and now has grown back for a second crop. Those late rains in May and June helped more than our grazing of cows: it helped our second growth rye grass flourish. Now we have gone back through the fields, cut the grass, let it sun dry, raked the grass into large rows, and are now baling the rye grass into hay bales. It's quite the process with our old equipment and coastal fog, but allows The Girls to enjoy more home grown feed!! 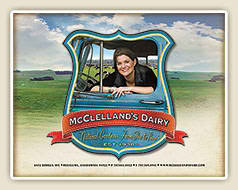 Born & raised on our dairy farm, I now assit in the managing of McClelland's Dairy, a family farm in the coastal hills of Sonoma County. Our family has organic grass fed cows and we make organic dairy products, including European Style Organic Artisan Butter.